which I offer out of my own love for the hobby, the reef animals & you. Beautiful tank raised aquacultured Soft Corals as well as LPS corals, reef safe fish, inverts & more for sale that you see (& don't see!) in my pictures above & a ton MORE! Shipping is always 50% OFF FedEx Base rates or stop in & pick out your favorites! 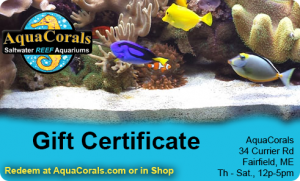 Buy my quality reef equipment and suppllies needed to set up & maintain an easy & successful reef aquarium like mine! I only offer what I use myself so if you do what I do using the same equipment, you will duplicate my "recipe" for success! Learn ... through my articles "How To Setup a successful Reef Aquarium" & "Self Help" articles which give you answers to common questions. I share my 20+ years experiences with you!